Kuala Lumpur, 28 March 2019 – After their announcement late last year, Goodyear is now presenting its flagship performance tyres at the Geneva International Motor Show 2019. Attendees of the motor show will be able to witness the Goodyear Eagle F1 SuperSport, Eagle F1 SuperSport R and Eagle F1 SuperSport RS. The tyres deploy innovative technologies and compounds that enable significant improvements to braking distances and lap times without neglecting more intangible elements of the driving experience, such as feedback during turn-in, under braking and approaching breakaway. 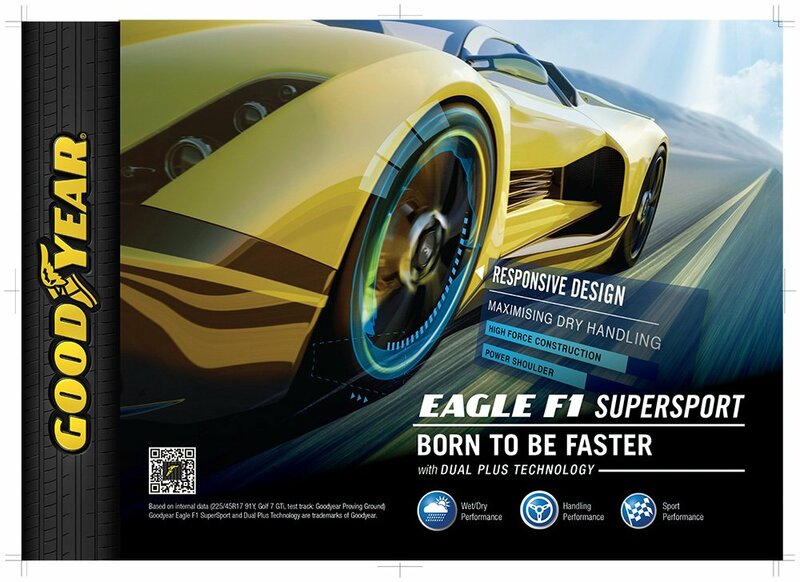 The Eagle F1 SuperSport draws on Goodyear’s racing experience to provide superior grip and handling. Responsive directional changes are ensured through the stiff tread ribs while a massive closed outside pattern, used on the tyre’s shoulder, provides control during load transfers in corners. A super-stiff sidewall design further improves handling without unduly compromising ride comfort. Although primarily developed for dry conditions, Goodyear has innovatively addressed wet performance through the deployment of a multi-compound combination that sees dry-optimized outer sections paired with three wet-optimised central segments. This enables drivers to safely push harder through corners on dry roads while still enjoying an exceptional wet braking and wet handling performance. The Eagle F1 SuperSport R further increases grip levels and steering precision on and off track. Grip levels are enhanced through use of a high-friction compound that provides exceptional dry grip levels, while excellent cornering stability is ensured by bridges in the tread pattern’s inner groove reducing deformation of tread blocks under extreme cornering forces. Steering precision and feedback have also been further enhanced by optimising the tyre’s footprint for more consistent pressure distribution. The Eagle F1 SuperSport RS is Goodyear’s most race-focused tyre, designed to push the limit on track while remaining road legal. A highly specialised racing-originated compound provides ultimate grip and performance levels in dry conditions. Goodyear is one of the world’s largest tyre companies. It employs about 64,000 people and manufactures its products in 47 facilities in 21 countries around the world. Its two Innovation Centers in Akron, Ohio, and Colmar-Berg, Luxembourg, strive to develop state-of-the-art products and services that set the technology and performance standard for the industry. For more information about Goodyear and its products, go to www.goodyear.com/corporate.